As Golf evolves, TheGrint does too! Don’t worry… These will not be it. We have plenty more coming for you. As you all might have noticed, we made some changes to how TheGrint App and Website look like. However, we still provide the same Features as before, plus some new ones. The Green button, which is a the Circle with a Plus (+) sign located in the center of the bottom menu, allows you to post things. 2. 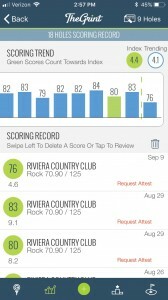 Score: Upload a Total Score or send us an SPS (Scorecard Picture). 3. 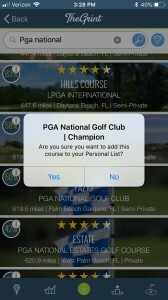 Play: Begin a Round Setup or Create a Live Leaderboard. 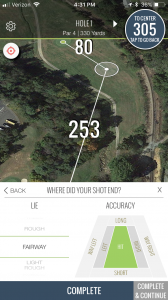 As the Name states, this feature allows you to track every shot you hit. 1. You select the Club. 2. Select where your Ball is before starting the Tracking. 3. Select the Target you are trying to hit as well as the intended Distance. 4. Tap on Next. 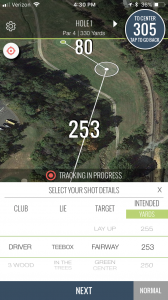 Hit your Shot and Track it up to where you hit it. 6. Enter the Lie where your Ball ended and where exactly on the Hole. 7. Tap on Complete & Continue and track the next one. When you finish the Hole, just Stop Tracking everything and Tap on Continue. This new Home Page allows you to see everything more clearly and get to the Features quicker; as well as see your Stats and information much better and simplify. This is another Redesigned Section that shows you all of your Scores (18-holes & 9-holes lists) as well as your Index and Trending Handicap with a graph showing which Scores are the ones counting towards your Index (Green Bars) and the ones that are not (Blue Bars). 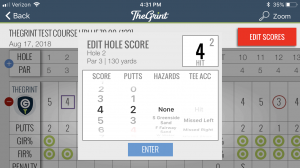 If you Tap on a Score (hole-by-hole score) it will take you to the Scorecard. 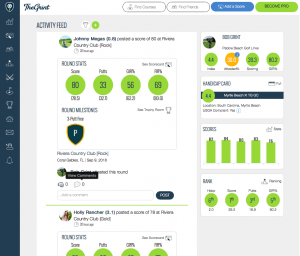 Where it will allow you to Edit the Score and Stats you tracked. to be updated. Then tap on Enter and when you are done, tap on Edit Scores again or tap on Back. Make sure you select “Yes post the change” if you want to make the change or “Discard Changes” if you don’t want to submit that change. NOTE: If that score was Attested, then you will lose the Attest since the score changed. Simply request your friend to Attest the score again. This is a brand New Feature that many of you requested. 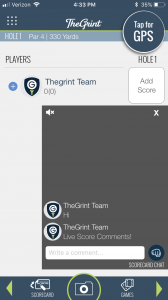 This feature allows you to have a Live Chat with those in a foursome or in your Live Leaderboard. 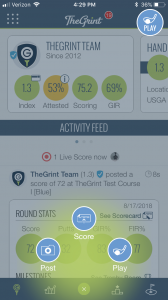 If you are tracking the Score for your foursome they can still see everyone’s comments by tapping on the Live Score showed on their Activity Feed and then by going to the Score itself. A Chat Symbol will be on the Bottom Right of the Screen. Tap on it and you will be able to chat with your Partners. This Feature works the same way with a Live Leaderboard. As soon as you all Join the Leaderboard and enter the 1st Score on Hole 1, you will see the Chat Option on the Bottom Right of the Screen. This Chat can be seen by everyone who joined the Leaderboard. 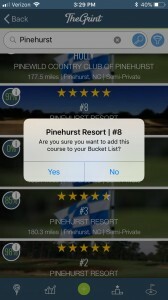 This feature allows you to have your own Favorite List, Bucket List & a Discover List that shows you Courses other Grinters have rated around your Area or around the World. You can Search any Course you want on that Discover List and by Tapping on it, you can Add it to your Bucket List. If you played it or when you play it, a “Played Stamp” will be shown on top of the Course Name on the Bucket List. 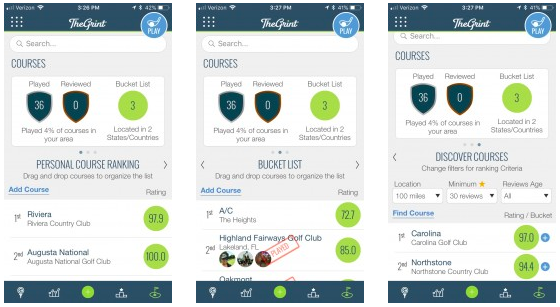 You can Add any Course to your Favorite List by tapping on “Add Course”, as well as the Bucket List. All of these features are cool and we know that some of you wanted them. We worked hard to develop them and we will continue working hard on developing any other feature you Grinters want! Don’t hesitate to e-mail us at contactus@thegrint.com with your feedbacks, requests, questions, doubts. We take your thoughts seriously and we, just like you, want a better App with much better and cooler features. 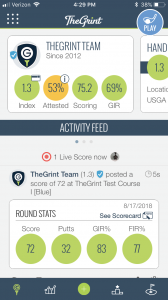 This entry was posted in TheRange Blog and tagged App features, free golf handicap, golf, golf game, golf handicap service, golf handicap tracker, golf stats, shot tracker, TheGrint. Bookmark the permalink.